Beijing audiences, both young and old, can be treated to two shows in the chilly month of December. 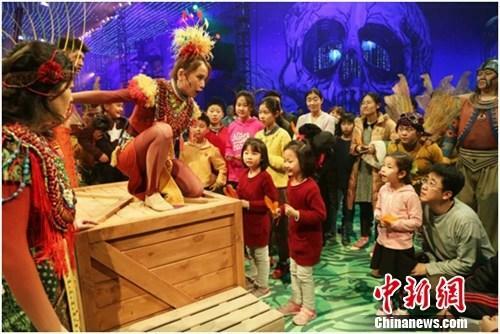 A family-friendly Broadway production, “Peter Pan’s Adventure Island,” has chosen Beijing to make its premiere. And the domestically-produced NCPA Dance Festival 2016 has wrapped up its two-month run with a special performance combining some of the country’s best works. “Peter Pan’s Adventure Island” promises to give audiences the “fresh” experience of “immersive theater.” Renowned Broadway producer Randy Weiner has worked on the idea over the past two years. And what is “fresh” about the drama, is that audience members can join the actors and directly participate in the play. "Peter Pan's Adventure Island" promises to give audiences the "fresh" experience of "immersive theater". Tony Award winner David Gallo designed the 8,000-square-meter stage, incorporating fantastical visual and interactive elements. The fancy stage added to the story behind the drama. After its outdoor premiere on Dec. 10, the play is now being performed every weekend until 2018 at Beijing’s Xiedao Resort. Meanwhile, a final performance has been staged at the NCPA Dance Festival 2016 in Beijing’s National Center for the Performing Arts. The closing ceremony included ballet, modern dance, contemporary dance, dance opera and dance poetry, a review of the prominent local dance creations of 2015 and 2016. “This is the first time that hip-hop has been put on the stage at the NCPA. The dance ‘My Hip-Hop’ involves several typical characters of our everyday lives. It’s a reflection of ordinary people,” said Xia Rui, chief secretary of hip-hop committee, Chinese Dancers Association. NCPA Dance Festival 2016 has come to an end after more than two months, but returns next year.